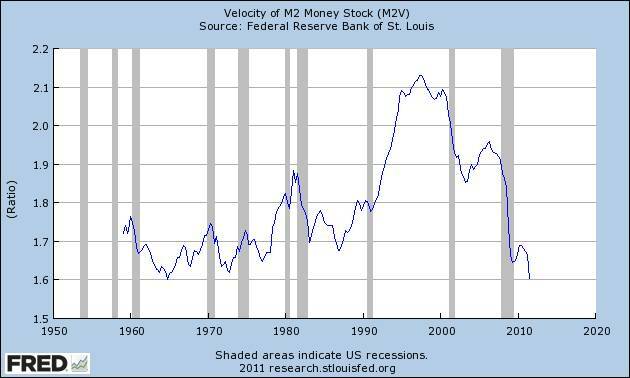 Money moving around the economy is slowing again in Europe and in the U.S. as the chart below shows. (We brought this same issue up in June and early September of 2008.) Remember this chart because we will come back to it. 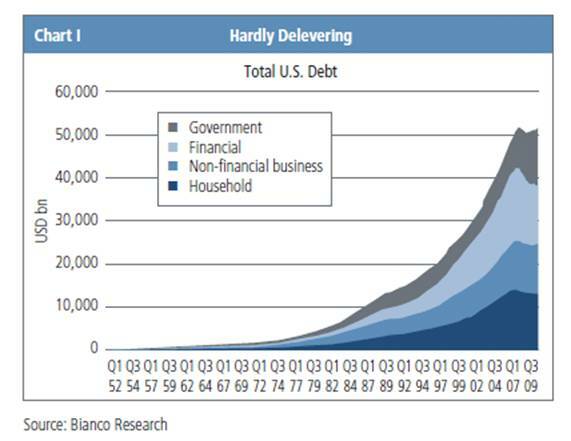 Basically, to keep prices up (and not have a full blown deflationary Depression) debt must continue to grow. Governments stepped in after the last crisis to fill the debt gap created by the shrinking financial sector (chart below). This prevented a deleveraging and the widespread forced selling of assets from occurring. But now, governments have reached their own borrowing limit dictated to them by the bond market (i.e. Greece) or their populace (i.e. Tea Party). As Bill Gross, world’s largest bond fund manager, states: “The financial markets are slowly imploding – delevering – because there’s too much paper and too little trust.” With little trust, money slows (the first chart we spoke about) and the financial system locks up again. Below is the first chart we presented with the inflation adjusted S&P500 overlaid. Individual investors’ bullish sentiment jumped to an 11- month high this week. The number of individual investors calling themselves bears also fell to a record low (i.e. they gave up). And since individual investors as a group are always wrong when it comes to the direction of the market, we can only suspect that the jump in sentiment will be over the cliff. “The "jump" kill involved what seems like a simple plan. Hunters would frighten or spook a herd of buffalo off of a cliff or high bluff. But to make the plan work required strategy. The right site had to be located, the animals had to be directed to the spot, and they had to be stampeded over the edge.” – Mass Kills. Texas Beyond History. While there is no ‘plan’ to drive the investment herd over the cliff, financial markets regularly (in fact, almost always) blind investors to the dangers. 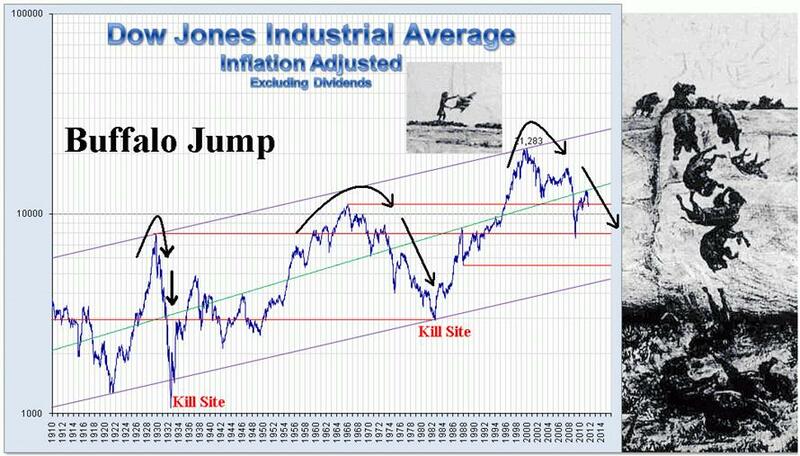 Looking at the inflation-adjusted Dow Jones Industrial Average (chart below) and our progress so far in this secular bear market, we could not help but think of the Buffalo Jumps of the Great Plains. Head-Smashed-In being the best named. We can only imagine the feast of cheap investments that await us at the bottom.